In the corridor outside the Federal Highway Administrator's office on the fourth floor of the Department of Transportation Headquarters in Washington, D.C., the wall is lined with portraits of previous chief executives of the Federal highway agency. The portraits begin with General Roy Stone. On October 3, 1893, he established the Office of Road Inquiry (ORI) in the Department of Agriculture. 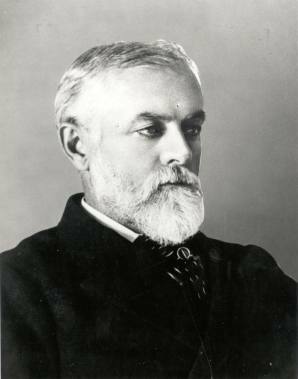 In the black-and-white photograph, General Stone looks sternly to his left, a handsome man with short gray hair and a well-trimmed beard. The narrative accompanying the portrait gives us only the sketchiest outline of his life and accomplishments. Who, then, was General Roy Stone? Roy Stone was born on October 17, 1836, in Plattsburg, New York, to Ithiel V. and Sarah Stone. His family had been among the early settlers of the region and his father owned a large estate. (1) Roy, who was Ithiel and Sarah's only son, graduated from Union College, Schenectady, New York, in 1856. By the start of the Civil War, Stone was 24 years old and had moved to Warren County, Pennsylvania, where he managed his father's lumber operation. Fort Sumter in South Carolina was a symbol for all that had come before-the raging debate over slavery that had divided the Nation in fiery rhetoric and political stalemate; the secession of seven lower-South States from the Union in February 1861; their attempt to pull the rest of the southern States into the Confederate States of America (C.S.A. ); and the pledge of the new President of the United States, Abraham Lincoln, to hold the Union together. Sumter was a Union fort in a seceded State. With Union ships on the way to supply the fort and protect it from the hostile forces surrounding it, President Jefferson Davis of the C.S.A. ordered General Pierre G. T. Beauregard to capture or destroy the fort before the fleet arrived. First, in keeping with form, General Beauregard asked the commander of Fort Sumter, Major Robert Anderson, to surrender. Anderson, as expected, rejected the request. On April 15, President Lincoln called for 75,000 volunteers to serve in the Union army for 90 days. The war that was about to begin was not expected to last even that long. While the volunteers were waiting at Smethport, one of the recruits spotted a deer hanging outside a butcher's shop. Cutting off the tail, which was somewhat larger than usual, he placed it in his cap. Spotting the recruit with the big bucktail in his hat, Kane decided that Bucktail would be the perfect name for his volunteer regiment from the mountains of northern Pennsylvania. In May 1862, the unit was split. One battalion under Lt. Colonel Kane was sent to the Shenandoah Valley in Virginia. Major Stone was ordered to take the second battalion, consisting of six companies, to join the Pennsylvania Reserves of the Army of the Potomac on the Peninsula in Virginia. (14) The Peninsula was so named because it had been formed by the York River on the north and the James River on the south, with the Hampton Roads shipping channel surrounding the southern tip. In June 1862, Major Stone played a prominent role when his Bucktails were engaged at Mechanicsville, Virginia, on the Chickahominy River. During the morning of June 26, at the start of what became known as the Seven Days, Stone led three companies of Bucktails to Atlee's Station in support of the cavalry. The other three companies of Bucktails and the Fifth Regiment were assigned to watch the Meadow Bridge crossing of the Chickahominy River. When the three companies and the Fifth Regiment were mistakenly withdrawn from the bridge, General A. P. Hill's Confederate division began crossing the Chickahominy. Stone's three companies were cut off and at risk of capture or defeat. Learning of the withdrawal at Meadow Bridge, Stone warned Company B in time for it to retreat to safety by a roundabout route. He then rushed ahead to warn Company D, the next in line. Assisted by a small guard of cavalry, Stone led Company D on a long detour to safety. Stone's order to Company K to retire was not received, but after recognizing the danger, the company hid in a nearby swamp until the danger had passed and worked its way to safety over the next 5 days. Stone and the Bucktails remained in their rifle pits without cover during the night. General G. A. McCall, in his battle report, singled out Stone for thanks. Stone noted in his own report the next day that the Confederates had "melted away." His course, for a half mile after leaving the intrenchments, was one that was within range of the rebel batteries. The movement was necessarily hurried; as in addition to the force in their front as they fell back, the Bucktails had been flanked. Major Stone ordered Captain Holland, with Company A, to take position 300 yards from the ford and obstruct the hostile advance. Captain Wister, with Company B, was to destroy the bridge at the Mill Hospital [on Ellerson's Mill Road]. Captain Niles, of Company E, was holding a detached position with portions of Companies E and D. In some way he did not receive the order to fall back until after the bridge had been destroyed and the other companies had retired. He therefore found himself left in the swamp at the border of the creek. Both Captain Holland and Captain Wister, the latter sustaining a wound in the ankle, performed the duties assigned to them in a manner worthy of the greatest praise and enabled Major Stone to bring his force within the lines. Yet the action had cost dear. It was necessary to abandon the dead and wounded; the heat was so intense that men fainted; and the movements were executed with such rapidity that many dropped from exhaustion and were captured. After Governor Curtin approved the project, General McClellan issued Special Orders No. 196 directing Stone to return to Pennsylvania to recruit a new brigade of Bucktails. (29) Captain Langhorne Wister, still bothered by the ankle injury he sustained at Gaines' Mill, requested permission to return to his native Philadelphia to help in the recruitment. As an added incentive, the county would give the volunteers a $50 bounty. Those who did not volunteer might be drafted in response to President Lincoln's call for 300,000 recruits-and receive no bonus. Stone, elected a Colonel, organized the 149th at Camp Curtin, where they spent 2 weeks in August amidst poor sanitation, foul smells, and swarms of flies. Ten companies were formally organized during the last week of August, receiving their uniforms, Enfield rifles, and some of their bonuses. By early September, Wister's 150th Regiment was in Camp Curtin. Aside from politics, Stone's attempt to complete his four new Bucktail regiments was undone by the emergency in Washington. Beginning in early August, Union and Confederate forces had been engaged in a series of battles in the vicinity of the capital. Beginning with the August 9 retreat of Union forces at Cedar Mountain in Culpeper County, Virginia, the Union's ability to protect the capital was in question. One of those outsiders, Private Avery Harris, particularly resented Stone's preference for the two Bucktail units, especially Stone's own 149th. Harris' recollections would tarnish Stone's reputation years later and would echo in the histories of the war. As a result, Stone's and Wister's regiments were known as the New Bucktails, the Second and Third Bucktails, and even as the Bogus Bucktails. While on the recruiting assignment, Stone took time to marry Mary Elizabeth Marker at the First Presbyterian Church in Pittsburgh on August 14. They were to have two children, Richmond (who died in adulthood of typhoid fever) and a daughter, Margaret, born June 5, 1865. She would marry Lord Monson and live in London.